Three years ago, at 2:46 p.m. local time (10:46 a.m. ET), Japan’s very foundation was rocked by a 9.0 magnitude earthquake. The entire island of Honshu shifted eight feet to the east, and portions of the coast near the epicenter dropped nearly three feet, making the resulting tsunami just that much more devastating. The confirmed death toll rose to 15,884 and to this day 2,636 people remain unaccounted for. More than 267,000 Japanese are still displaced, their homes leveled by the quake, washed away in the tsunami, or rendered uninhabitable by the nuclear disaster at Fukushima. Substantial progress has been made in the clean-up and rebuilding effort all around the Tōhoku region, but there is still so far to go. So today, on the three-year anniversary of the Great Tōhoku Earthquake, I think with sadness of all those who died in the disaster, send up a prayer that the families of all those still missing will find peace, and offer heartfelt encouragement to all those who are waiting for and/or working towards a return to normalcy. Why didn’t you just say ‘eulogy’? I should have put forth more effort. I heard “panegyric” spoken aloud for the first time Monday night. Unfortunately, it was spoken in the final round of a grown-up spelling bee in which two teammates and I were participating for charity. None of the three of us had ever heard the word. No wonder, looking at its rate of usage since 1800. I don’t think the emcee had heard it either, seeing as he pronounced it three different ways in the fifteen seconds we had to write it down. None of his pronunciations brought to mind that mystery word I had skipped so long ago. So we made our best guess p-a-n-a-g-e-r-i-c. And were promptly eliminated. Only one team knew how to spell panegyric…and it wasn’t mine! 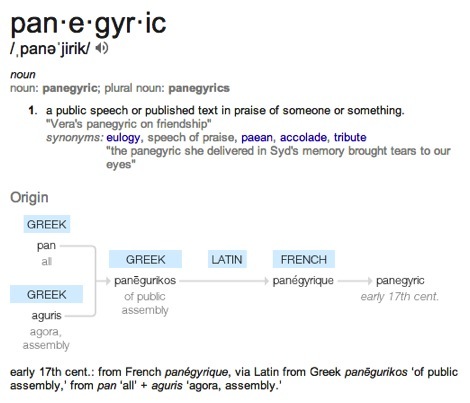 Although we lost the spelling bee, I like to think that we served a higher purpose, helping panegyric step out of the shadow of its better-known synonym, eulogy, at least for a few days. Usage will subside again to pre-bee levels once the Caffeinated Hyphens quit bragging about their win and the Spellcasters and They’re Highnesses finish lamenting their elimination. Why is only some of the vegetation covered in ice? 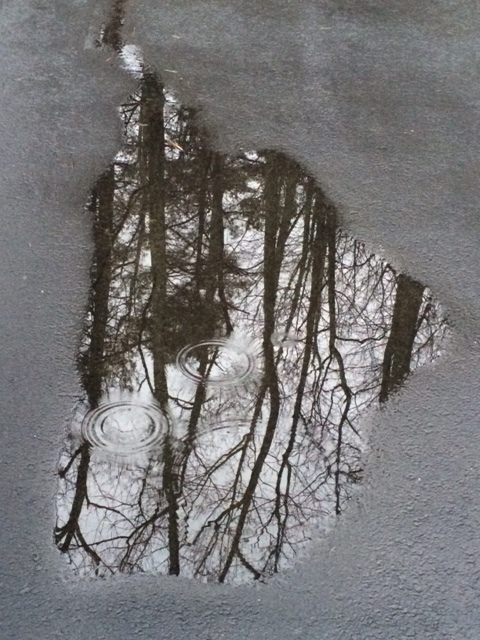 The water level did not fall, so perhaps the wind blew water droplets onto the shore? If it was the wind, why weren’t all the leaves and twigs here coated? And how do you explain this icy jellyfish?? Photo from Google Image search, credit goes to ???? I made it. December 31 is here. The challenge I set for myself on January 1 was to blog every day in 2013. I will call the challenge successful, but not perfect, as I did not post on four days (two in September and two in October). However, I’m ending the year with a total of 380 posts (15 more than required), 150 followers (145 more than expected), and nearly 7700 views. So even though the perfectionist in me isn’t quite convinced that the goal was met, I am still proud of my accomplishment. I do have the discipline to sit down and write (nearly) every day, so if and when I get around to writing a book, I won’t be wondering if I have the tenacity to complete it. Once I found out friends and family members were following my blog, I became even more neglectful than normal about writing and responding to emails. The blog became my correspondence, which was not fair. I find writing fiction difficult if I am not “feeling” the prompt. I know for certain now that there is no point in sitting down to write a novel until I am connected to a storyline, a setting, and/or some characters. Without a connection, my story will be crap, and the process will be painful. A supportive community is key to this blogger’s motivation, and I found several this year, both in writing and photography circles. If I am going to pursue photography with any degree of seriousness, I need a refresher course on the manual settings on my camera. The iPhone camera is convenient, and takes remarkable pictures for its size, but it is not a replacement for a “real” camera. I love looking at people photos, both portraits and candids, but I am very uncomfortable taking them. Even with permission, I feel I am invading the subject’s privacy. 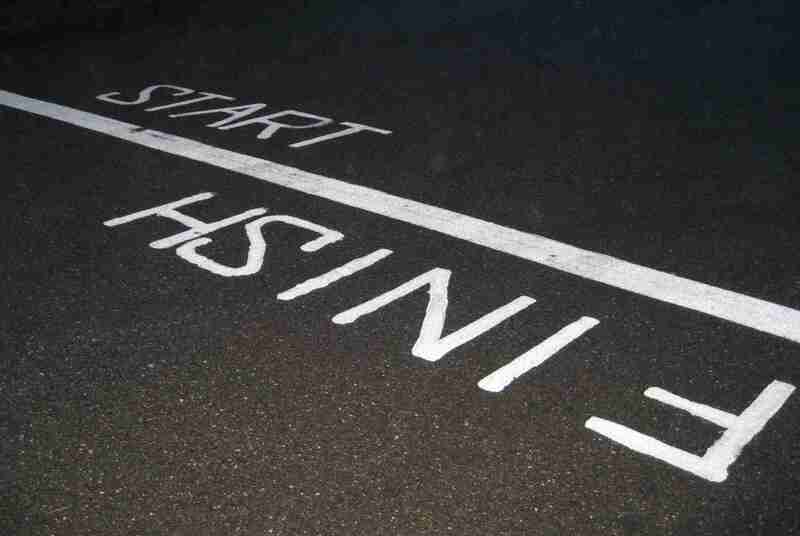 It seems in life that every finish line crossed is actually the starting point of something else. That holds true for this blog. While I won’t be holding myself to the post-every-day regimen of the past year, I will stick to a regular routine (schedule to be determined) that will include photography challenges, responses to flash fiction prompts, and occasional commentaries on life in general. I’m also developing an idea for a personal challenge in 2014, and trying to decide on the best way to use my blog in the fulfillment of that goal. I’ll keep you posted as the plan comes together. So, I’m taking a couple days off, but want to thank all of you who have come along for this ride in 2013. 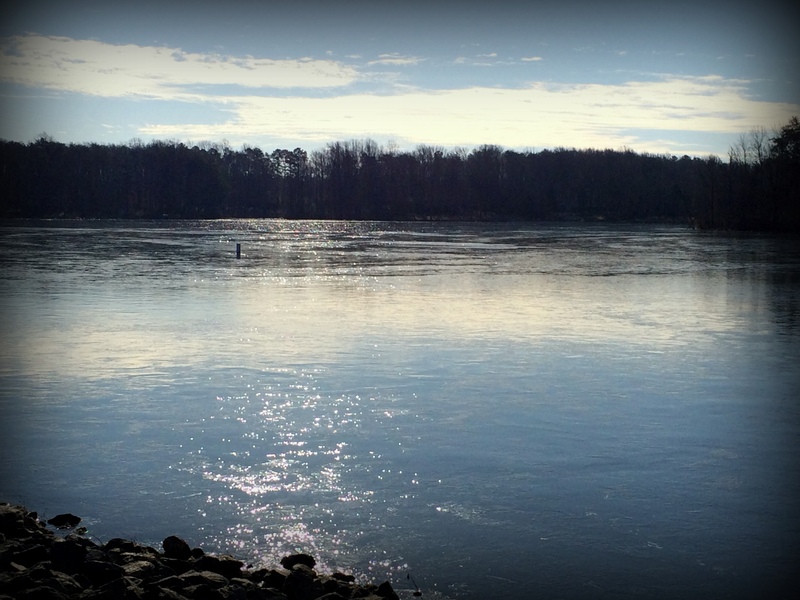 Your support, encouragement, and feedback have been invaluable in helping me make my blogging challenge a success. I look forward to continuing the journey with you in 2014! All I want is a milkshake. Please? Pretty please? I don’t know what I was thinking when I planned my day. I guess I’ll blame it on being out of the country for the last five Christmases. I don’t know whether the Christmas Eve madness got worse in my absence, or, like they say about the pain of childbirth, I just blocked it out of my mind. I did well before I walked out of the house. By 6:45 a.m., I had tutored online for an hour, baked two batches of cookies, and washed all the cookie-making dishes. This day was gonna roll right along. Then I got in my car and drove to town. I went to the gym…no problem. I went to the Red Cross office and donated blood. Easy peasy. Then I went to the grocery store. Oh. My. Gosh. Over two hours to find and buy just 17 items. I’ve never seen so many people in a supermarket. The produce section was a total bottleneck…carts scattered every which direction, people wandering aimlessly from clementines to potatoes back to bananas, no fewer than eight stockers with their trolleys parked inconveniently in the major pathways. But that was nothing compared to the baking aisle. Complete gridlock. If anyone managed to get in, they weren’t getting out until the crowd deemed it time. It’s a good thing shopping carts aren’t equipped with horns, or my ears would still be ringing. By the time I’d gathered everything I could from my list, I felt as beat up as the poor cashier looked. And I’d been to the gym. Plus I’d given blood. I was feeling puny. I needed a milkshake, stat. 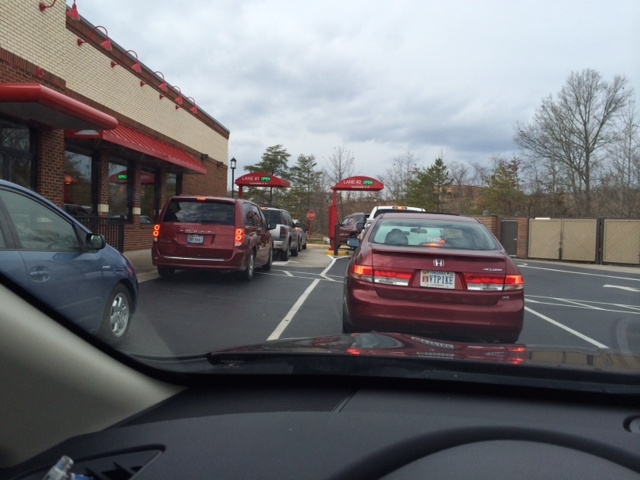 Fast forward (not really…traffic wouldn’t allow it) to the Chick-fil-A drive-thru. It’s a two-lane set-up, and they were stacked eight deep on both sides when I pulled up. Obviously, all the last-minute bargain hunting had driven the entire shopping public to starvation. Chick-fil-A has always had my respect as the fastest, friendliest, most efficient fast food establishment EVER, so I was not worried. Ten minutes after taking my place in line, I hadn’t moved an inch. Not. One. Inch. Cars continued to pile up behind me, and all the slots for dine-in customers were filled. Christmas would be here before I got a milkshake. I pulled out of line in defeat. I’ve been away for five years. Apparently I no longer know how things work around here. Can someone tell me when the holiday retail madness subsides and a girl can get a milkshake? Ever have one of those days when you wonder if you did, indeed, just fall off the turnip truck? When you come across something so completely foreign to you, but presented so matter-of-factly, that you wonder in paranoia if you are the only one on the planet who had never considered it? Welcome to my Saturday morning. 30,144 total servings of vital nutrients. Including grains, fruit, vegetables, dairy, protein, baking essentials, and drinks. Up to a 25-year shelf life. $3,499.99 delivered after $500 off. I’m not totally naïve. We get ice storms and the occasional hurricane here in Virginia…it’s very possible we could be stuck without power for a couple days. Nor am I totally unprepared; we have some basic emergency supplies, and I even know where most of them are. But our food rations, when they haven’t been raided because I’m too lazy to go to the store, consist of a case of bottled water, a Costco-sized multi-pack of canned tuna, some sliced peaches in light syrup, a jar of Jif, and a mega-box of granola bars. Stockpiling a year’s worth of food never, ever, not once crossed my mind. Is this for real? Do people really do this? Judging by the nine product reviews on the Costco website (seven of which actually seemed legit) people really do. Browsing the site for more info only led to more questions. Why? Why would anyone hoard a year’s worth of food? Nuclear attack? Asteroid impact? Alien invasion? Zombie apocalypse? What will the neighbors think when the UPS man rolls up your drive and stacks 63 boxes on the front porch? Apparently, UPS is not involved—it seems that a private shipper, in a truck much larger than the standard brown UPS van, delivers a pallet, which is discretely wrapped in black plastic to hide its contents from the prying eyes of neighbors. Why the need to hide this delivery from the neighbors? A couple guesses here. One, so that they won’t be able to confirm that you are indeed the paranoid doomsday adherent they’ve always suspected you to be. Two, so that when the end does come, you won’t have to defend your stash from hordes of ravenous neighbors who know that back in 2013 you alone on the block prepared for this very scenario. Where does one store this kind of cache? The shipment consists of 378 #10 (one gallon) cans of food. At an average of 4.5 pounds per can (dependent upon contents), that’s 1710 pounds of food that needs a home. I’ve never seen a pantry designed for that sort of storage. Shelves would buckle, and it wouldn’t surprise me if the floor wouldn’t follow suit. Even in our house, where our “safe room” is a concrete floored, windowless storage room tucked in the back corner of the lower level, stockpiling that much food would be a logistical nightmare. How does the manufacturer ensure a 25-year shelf life (on selected products)? I slice a banana onto a scoop of vanilla ice cream to make a banana split, and the fruit is turning brown before I get downstairs and settle on the couch to eat it. What in God’s name does one do to banana slices (two cans are included) to make them last for 25 YEARS?? What should one do with all this food In the event that the end of the world as we know it does not come before the food’s expiration date? At $3499.99, I certainly can’t, in good conscience, just send it to the landfill. On the eve of their 20-year expiration, do I donate 27 pounds of fudge brownies to the local elementary school’s bake sale? Do I throw a party in year 10, and try to slip 18 pounds of canned sausage into some creative hors d’oeuvre? As for the 42 cans of hard white winter wheat, I wouldn’t have the foggiest idea where to start, short of chucking it out the back door for the birds. Best if used before December 2038. After a whole day of pondering these imponderables, I’m exhausted. Regardless of how irresponsible it makes me seem, I can’t see myself purchasing a year’s worth of food to be delivered on a shrink-wrapped pallet. If the world ends and we run out of tuna and peanut butter, perhaps someone better prepared than I will share a can or two of taco TVP*.